This performance used an updated libretto written by our members, it is available to rent by contacting the committee. True to form, the AGM that followed the Carmen production saw another Chairman resign, albeit reluctantly, as Terry O’Farrell had to step down due to domestic reasons. It was a last minute decision and Tony Lehrle-Fry was surprised to end the day responsible for the running of the Society. He inherited two potentially problematic shows, Gianni Schicchi (which was well behind schedule) and Orpheus in the Underworld, which was undergoing a rewrite by a group of talented members. 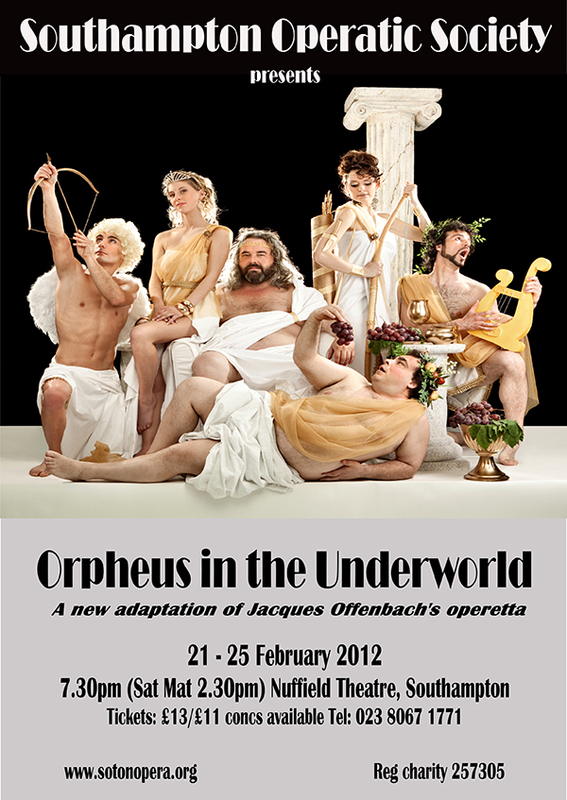 David Tatnall and Martin Paterson had offered to form the directing team for Orpheus but were also keen to ‘freshen it up’ by making it a two act opera, cutting out any dull songs and reworking the libretto – Nichola Paterson also helped with the latter, whilst Shaun Dodimead offered some outrageous suggestions! The final script was certainly entertaining and the music very lively. The usual rather dreary opening sequence, involving shepherds watching sheep and Calliope lecturing them, had been cut and replaced by the chorus singing to the tune of the Can-Can, followed quickly by Mercury (Matt Sturgeon) leaping round the stage performing I Hop – it was a frenetic start but it proved impossible to maintain that pace throughout, especially when some lengthy dialogue was involved. Perhaps the piece still needed some of the duller songs to emphasise the livelier ones? There were some excellent moments; Pluto sweeping sheep off the stage and into the orchestra pit, the drunken Ode to Venus (Lisa Axworthy), the addition of the Love Police led by Cupid (Abigail Miller) and Eurydice choosing an audience member as her ‘preferred love’ each night. However, Orpheus (Tony Lehrle-Fry) was nearly written out of his own opera (in Act 2 he only made a brief appearance at the end) and the omission of several songs meant the show was over far earlier than usual. Sadly, ticket sales for Orpheus did not ever ‘get off the ground’ and a ‘half house’ was achieved for one performance only, leading to a loss of £3080. Fortunately, the rewrite did mean that royalties were not added to the cost of performing the show.